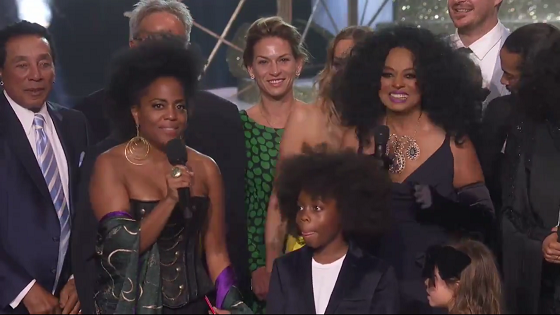 Music legend Diana Ross received the Lifetime Achievement Award on Sunday night during the American Music Awards. Ms. Ross called her family on stage with her, including daughter, Rhonda, who played Toni Burrell on NBC soap opera Another World during it's last years on the air. "With no apology, and in all of your power, with integrity, grace and generosity, you blazed a way, not just for us, your children, not just for women, not just for black folk, not just for singers and performers and entrepreneurs, but for all of us, we are so proud to present you with the American Music Award for lifetime achievement," Rhonda said. After being presented with both the award and her iconic fanny pack, Diana teared up during her thanks. “This is all about love. All about love. This says it all. This is my family. And I'm sending love out there to all of you, each and every one of you of our global family. And I really, really love being here, and I feel so humbled by this,” she said.